Kuftstein to Innsbruck – 258.5 km. Starting out from the main square in Kufstein, the riders take on 35 undulating kilometers in the Inn Valley where a couple of small ascents will serve as excellent launch pads for attacking and getting into the morning breakaway. From Rattenberg to Pill, the route is identical to the men’s time trial course. The terrain is completely flat without any difficulties. The most important task here is to stay safe and avoid wasting any energy. Soon after crossing the river, the riders enter Terfens. This is where the first major struggle of the day begins. The following 2.6 km kick up with a staggering average gradient of 10.5 % and include a section of 500 meters with over 13 %. Most likely, the first big selection will be made here. From the top in Gnadenwald, 15 km remain before the riders cross the finishing line for the first time to take on the first loop of 23.9 km around Innsbruck. After a couple of flat kilometers throughout the city center, the road begins to kick up with about 20 km left to go of the lap. The climb towards Igls is 7.9 km long and has an average gradient of 5.7 %. It takes place on good and wide roads and it’s not too hard at the beginning. The steepest part comes halfway up, when the gradients surpass 10 %. This will be a good place for a strong climber to put in a powerful attack and make another selection. From the top of the climb, a fast descent – also on good wide roads – brings the riders back to the city center of Innsbruck. After crossing the river with about 4 km to the finishing line, the riders continue straight-out into a very narrow street. From here on, the next 400 meters are uphill with 7 %. It peaks at 11 % towards the top. Afterwards, a short descend leads the riders back to the river, which they will cross again with about 1.5 km to go to take on the last well-known stretch towards the finishing line. On the final lap of the course, the elite men don’t turn right after the short and steep kicker. Instead, they will continue to climb as they take on the infamous Hell Climb. 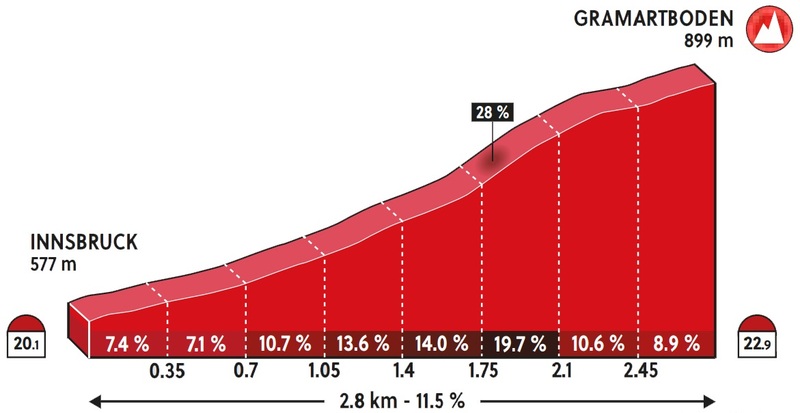 The total ascent is only 2.8 km long but with an average gradient of 11.5 % and parts of 28 %, many will see their dreams of the rainbow jersey crushed on the steep slopes. From the top, only 8.5 km remain. The descent is fast but still includes several hairpin corners before the road leads the riders back to section where they used to turn right on the previous laps. The final 3.5 km of the race are the same as usually. In total, the riders will have to overcome 4670 meters of climbing throughout the day. Ever since the announcement of the route, Alejandro Valverde has been the hot favorite to win. The Spanish veteran has finished on the podium at the World Championships no less than six times in his career but he has never won the rainbow jersey. The first time Valverde stepped onto the podium was 15 years ago. At age 38, it’s highly unlikely that he will ever get a better chance to finally take the only victory that misses on his palmares. On paper, he has all the qualities to win on this course. He’s amongst the best climbers in the race, he’s good on the descents, he’s punchy enough to get a gap on the steep percentages and he’s extremely fast on the line. It’s very hard to argue against Valverde winning this year. For once, the Spanish team is even build around him completely. There are no other options. It’s all for him. The only thing that speaks against Valverde winning is how he finished the Vuelta a España, going from being a serious winner candidate to finishing fifth after two bad days in Andorra. He looked spent after a long – and successful – season. However, if anybody knows how to prepare for a one-day event and get every last part of energy into the legs, it’s him. While Spain only has one leader, the French team has several options for a top result. The main candidate is Julian Alaphilippe. He’s primarily a punchy rider with a good sprint but in the Tour de France, he proved that he also copes well with longer climbs and is able to challenge the best riders uphill. As long as it’s only for one day, Alaphilippe shouldn’t find the combined elevation too hard to be in the mix for the win. Being amongst the best descenders in the world, he might even create a bigger gap on the final descent than he’s able to do on the steep section. France also has the likes of Romain Bardet, Thibaut Pinot, Warren Barguil and Tony Gallopin to play out once they reach the circuit. It’s hard to imagine a strong breakaway on the final laps without a good French rider in it. This means Alaphilippe will be able to safe his legs for the final part – if it comes back together. Prior to his crash on Alpe d’Huez in the Tour, Vincenzo Nibali was one of the top favorites for the win given his strength both uphill and downhill and his abilities to sense the right moment to attack. However, even though he seemed to get better day by day during Vuelta a España, he still didn’t seem strong enough to follow nor drop the other main candidates on this course. Instead, Italy will probably turn their focus to Gianni Moscon. After coming back from his ban, for hitting a rider in the Tour, Moscon has been absolutely flying in the Italian one-day races leading up to the World Championships. He said he had a lot to prove to the people not believing in him and he has obviously been preparing like never before. It’s yet to be seen if Moscon can handle nearly 5000 meters of climbing and still have a punch at the end but judging from his recent way of racing, it can’t be ruled out prematurely. The Italian team also has in-shape Domenico Pozzovivo who most likely will try to get away in a strong group on the final laps. The last steep climb (detailed below) is right up his alley. The same goes for Great Britain’s twin-duo of Simon and Adam Yates. The two Mitchelton-Scott riders are pretty similar in their characteristics. Both have a powerful kick on steep gradients and they cope very well with such a demanding course as this one. Simon is fresh of an impressive overall win in Vuelta a España. However, he had to work very hard for it and that may play a crucial factor in this race. Meanwhile, Adam had a relatively easy Vuelta, biting his time without doing any work until the very last stages where he then proved to be at an extremely high level. Of the two Yates brothers, he should be the freshest one. However, they both have what it takes to win this race. They are not excellent on the descents but they are not afraid to attack early. Whoever dares to put it all on the line could easily end up with the rainbow jersey today. Rider like Michal Kwiatkowski, Rigoberto Uran, Bob Jungels, Michael Woods, Rui Costa and Primoz Roglic are all also to be considered as strong podium candidates. Especially Roglic who decided to skip the time trial, in which he won the silver medal last year, in order to prepare solely for the road race. The Slovenian team has eight riders at the start and they are all ready to work hard to give Roglic the best possible chances for a top result. This year, the LottoNL-Jumbo rider has taken a step up the ladder. He has improved hugely on the steep climbs and his descending skills has proven to be amongst the best in the business. Furthermore, being a brilliant time trialist, he is able to keep a chase group at bay if he gets a gap at the end. For a few wild cards for a top result, look to in-shape riders such as Jack Haig, Michael Valgren, Ben King and Rein Taaramae. Tom Dumoulin must also be eager to bounce back after losing the time trial to Rohan Dennis with such a huge margin. The final start list for the race can be found here. After reading this long preview you now know all about the route, the favorites and the outsiders for the rainbow jersey and the podium positions. You may even have your own outsiders in mind. Wouldn’t it be great to use this knowledge to win big cash prizes? I’ve teamed up with the fantasy manager site Zweeler for this year’s World Championships. Their main competition has a prize pool of 2.000 Euros at the moment! In order to participate, all you have to do is click here, sign up and set your team. I hope you will end up with the winning combination of riders! For live coverage of the World Championships 2018 in Innsbruck go to steephill.tv.